I always treat travel, by whatever means, as an adventure (unless it is driving in the UK) and the less straightforward the merrier, as far as I’m concerned. I reckon a lot of this adventure thing came courtesy of the old man. 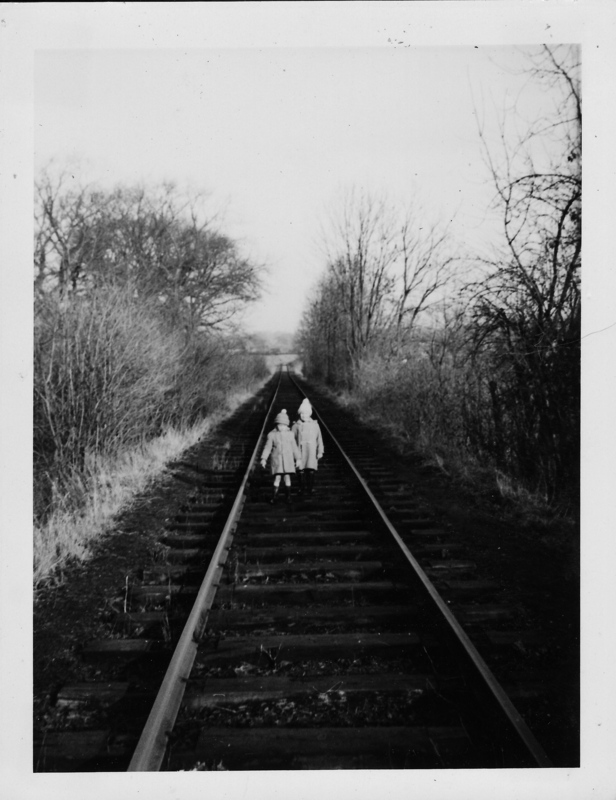 When we were kids we would go and visit all sorts of obscure places and every visit or journey was treated as an adventure. Since the demise of my dad’s Raleigh Safety Seven, purchased for a fiver in 1956, we ceased owning a car until about ‘63 so the train or bus was our transport. Luckily he got job in the late fifties assessing fire damage caused by steam trains that ran over the joint London Transport Metropolitan Line and British Railways (London Midland Region) track between Stoke Mandeville, Rickmansworth and Marylebone. Smuts frequently set fire to the line-side woods and crops and the occasional allotment shed as they climbed the Chiltern Summit, the highest point being behind Rusty Bob’s Farm at Dutchlands just down the road from the Black Horse at Great Missenden. As a result he got a free pass and, very occasionally, an LT Pool car. 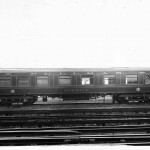 As a family we got ‘first class privilege tickets’ which meant we could travel anywhere on the LT network or British Railways including their ferries for quarter fare and not having a car we took full advantage of that. Head Office was 55 Broadway and from as long as I can remember I, and later my brother, would occasionally get a treat and go ‘up to Town’ with him for the day getting off at Marylebone and then walking through Hyde Park, Green Park and St James Park to the London Transport Offices breaking step as we marched over the Blue Bridge, quite a trek for little legs. 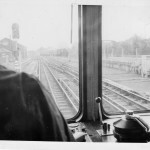 To make it a real adventure we would sometimes go into Aylesbury and catch the up South Yorkshireman or jump on the early morning ‘Breakfast Special’. 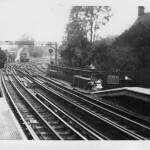 One day, I reckon summer 1960 going on the pictures I’ve recently turned up, my dad told me we were going to catch a Baker Street train and we’d change locos at Rickmansworth which was then where the electrified Underground lines finished. This was the first time I’d been into Baker Street. 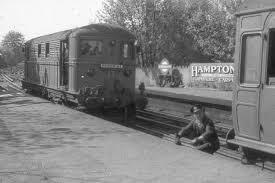 Naturally the moment the train stopped at Rickmansworth me dad and me were off up the platform to watch as they uncoupled the massive Fairburn 2-6-4 tank engine and coupled up the electric loco. It was claimed the changeover was the fastest on the whole system, if not the World, whatever the truth they regularly did it in three minutes flat. On the up it was pretty straightforward as they had the electric loco on the up and ready to back on to the stock as soon as the engine had run into the sidings but the down change-over was more complicated as the locos had run round but it did just give you time to run down the underpass and up the other platform to get a picture and then hurtle back before the steam engine coupled up. The front coach comprised the Ladies and No Smoking Third Compartments so once coupled up we had to make a dash back down the platform to our carriage. 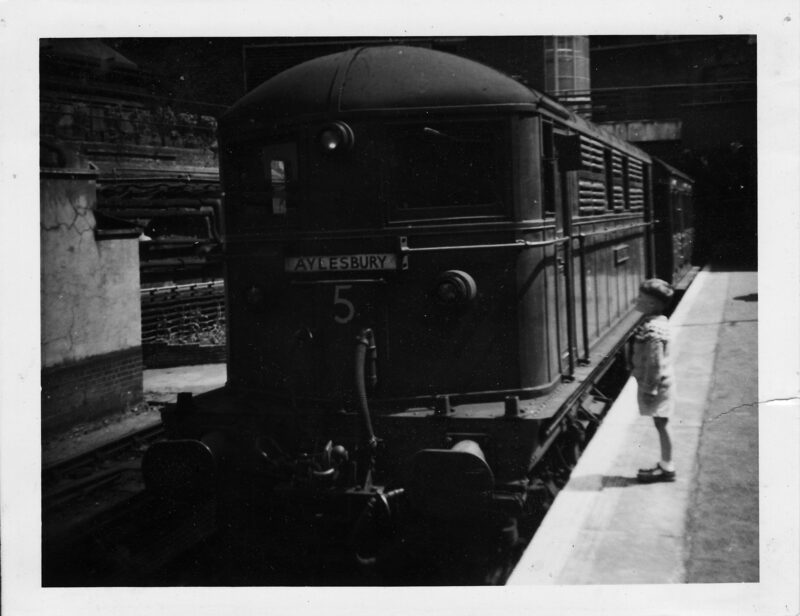 In those days though small boys and trains were an accepted thing and the guards and engine drivers were friendly and made sure you didn’t get left behind. 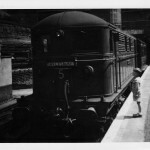 I can still remember this picture of me being taken by my dad at Baker Street. I recall being reluctant to stand so close to it as, without warning, the fans would suddenly start up and that frightened the life out of me. 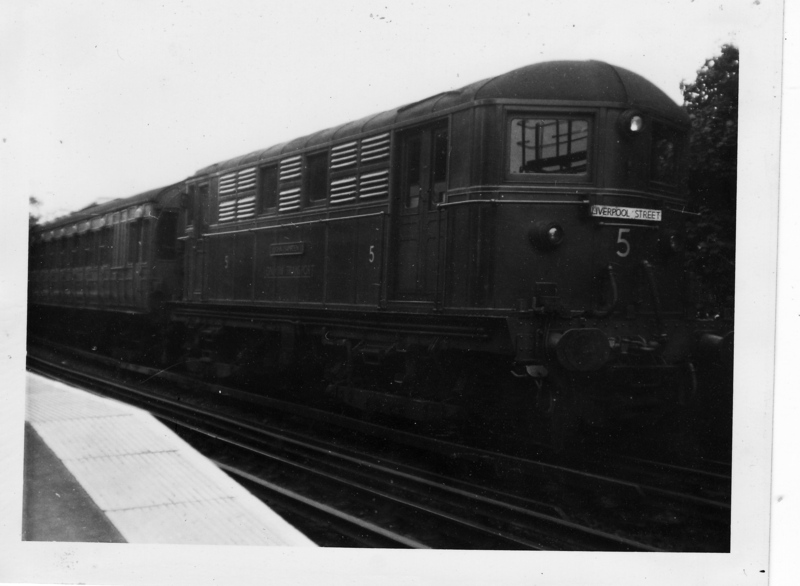 To be honest I always found these electric locos well scary but not as scary as the Globe Rectifiers my granddad looked after on the Met line, but that’s another story. They had a spooky life of their own, not in the warm powerful living steam sort of way but more like the truck in Duel. 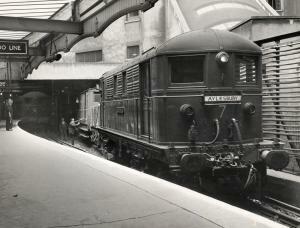 At Baker Street they lurked in tunnels or in tunnel sidings and hauled coaches called Dreadnoughts. These dark maroony-brown monsters still have an air of nightmare in my mind but to a small boy, even if they were scary and already 40 years old, they were nonetheless fantastical. 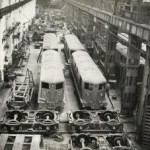 They sort of hummed, whooshed and groaned and smelt of Bakelite and random electricity, especially when the cooling fans cut in, and they did it with no one in the cab. The drivers were serious, wore a uniform, carried a black case and were clean. They reminded me of my grandmother’s house. This is hardly surprising seeing’s they were built about the same time. They were from the era that was Metroland immortalised by John Betjeman. I’m inclined to build a menacing shed in the shape of one at the bottom of the garden and frighten the grandchildren. If you enlarge this picture there is a ghostly one lurking in the background. I rest my case. These strange dark creatures did have names though, which was comforting. 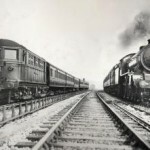 Following a meeting of the Metropolitan Traffic Committee on 18th March 1927 it was decided to name all the locos after people connected with places served by the railway apart from Number 15. 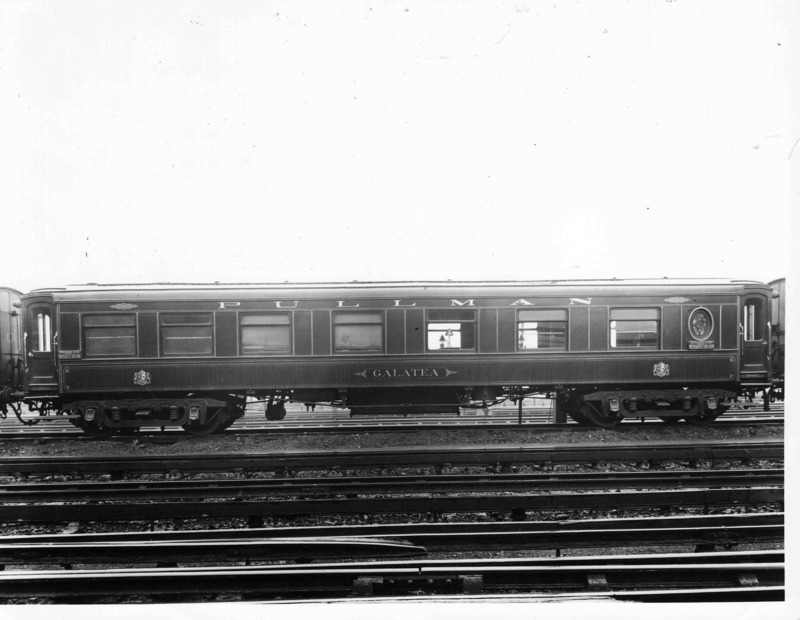 This had been exhibited at the British Empire Exhibition at Wembley in 1924 with the side cutaway and panelling removed so was called appropriately ‘Wembley 1924’. Later, according to those that know, it was renamed ‘Wembley’. My first meeting was with ‘John Hampden’, one of my latter day heroes and sported a large number ‘5’ on the front. 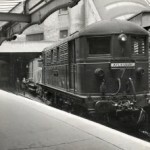 I soon made a point of trying to go on a different one each time but never got to travel on ‘Sir Ralph Verney’, a North Bucks landowner of some note (and Ralph was my brother’s name), but did see it lurking in the tunnel at the end of the Met platform at Baker Street once. Florence Nightingale was another. She lived at the Verneys’ Claydon House for a while hence the connection. I would never get to see or ride behind my namesake, Number 20 Sir Christopher Wren, the last one built as it had been written off in an accident in 1954. 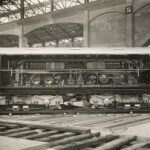 Unlike the romantic Pacific, Priarie or Atlantic of the steam world these were classified Bo-Bo on account of having a two-axle driving bogey at each end with a motor driving each axle. Built by Vickers Metropolitan in Barrow-in-Furness in the early Twenties, the story goes that the original 1906 ‘camel-backed’ electric locos were sent off to Vickers for a rebuild in 1920 but when they unplugged them and opened the lid it became apparent that a rebuild was going to be less than practical, never mind economic, so London Transport bit the bullet and changed the rebuild to an order for 20 all new electric locomotives. Taking some of the parts from the older locos Vickers set-to and by 1923 had designed, tested, built and delivered all 20 locomotives. They came in at 61½ tons, had four 300 hp (220 kW) motors approximating to 1,200 hp (890 kW) and could do a very respectable 65 mph. They were, in their day, state of the art. At 40 foot long its amazing to think that they were capable of accelerating from rest to 25mph in 25 seconds and could start a 265 ton freight train up a 1 in 45 gradient yet could shunt at speeds as low as 2mph. 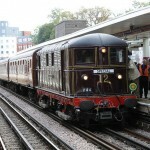 The trains they pulled, initially to Harrow-on-the-Hill and later Rickmansworth and Chesham, sometimes ran with a Pullman coach in the set for the exclusive use of the first class passengers. Two coaches were built named Galatea and Mayflower (after two yachts contesting in the 1886 America's Cup). 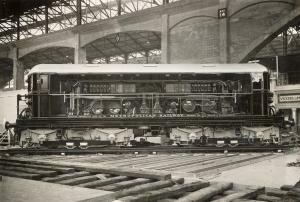 Introduced in 1910 they were the were the first electrically hauled Pullman coaches. They were withdrawn in 1939 neither survives but we’ve still got my dad’s old Bassett and Lowke 0-gauge ones! 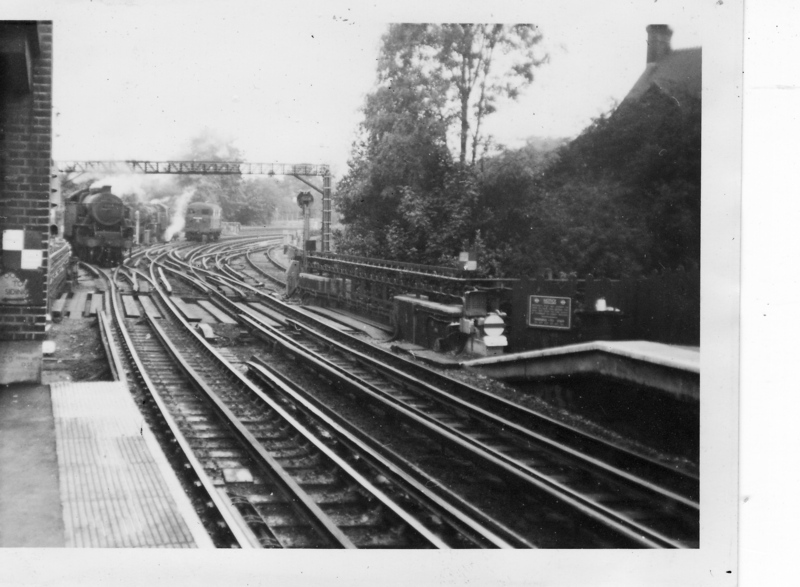 By September 1961 electrification was finally extended to Amersham and with the last London Transport steam train connecting service operating on 9th September 1961 the end was nigh for the Electric Locos as they were known. Soon DMUs were running to Marylebone and all new shiny silver A-stock Underground trains took over running ‘fast’ trains into Baker Street and, at peak times, onto Liverpool Street. Eight locos initially escaped the scrapper’s torch. Number 1 John Lyon, 3 Sir Ralph Verney, 12 Sarah Siddons and 5 John Hampden remained in service as shunters or hauling maintenance and engineer’s trains until 1966 when 1 & 3 were broken up for spares. John Hampden became a static exhibit in the London Transport museum but Sarah Siddons remained in service as brake block test bed. 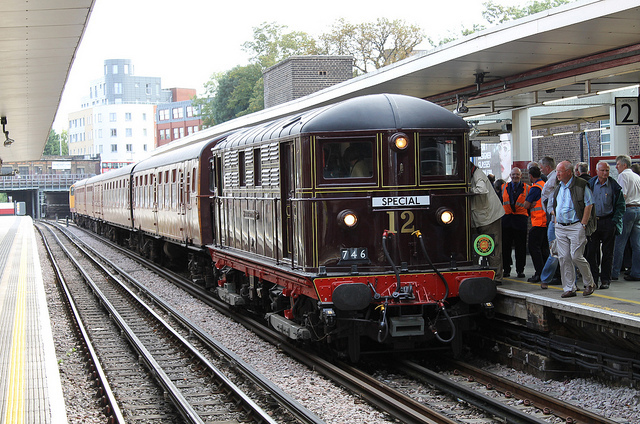 She was later fitted with equipment to allow her to run on three-rail systems and these days she is often seen pulling Enthusiasts Specials and has run through to Chesham, Watford and Amersham on ‘Steam on the Met’ Specials. You sometimes see her at Neasden sheds all nostalgic like. 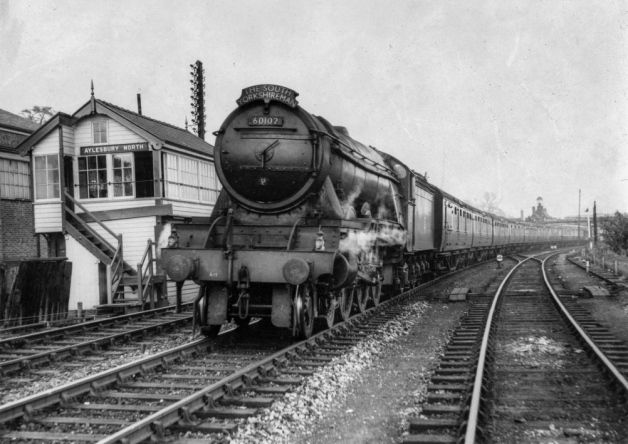 Meanwhile numbers 2 Oliver Cromwell, 7 Edmund Burke, 16 Oliver Goldsmith and 18 Michael Faraday went to the Electromotive Testing Facility at Rugby and were apparently still there in 1965 but were broken up shortly after. 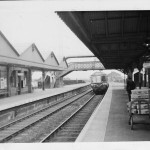 The picture I found is quite poignant and shows us leaving Amersham by DMU just after electrification and if you look closely (click on the piccie) there’s a B1 heading a down express approaching the new Amersham island platform where it sometimes stopped whilst it waited for the line ahead to clear and then ran onto Aylesbury, Leicester and Sheffield beyond. The train change wasn’t quite dead though as mainline steam still ran through Wendover to Marylebone some stopping at Amersham and, off-peak, the DMUs only ran from Aylesbury to Amersham and back. With the closure of the Great Central Railway north of Aylesbury the last expresses hurtled through Wendover in 1966. 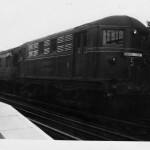 Steam on the Marylebone to Aylesbury service all but finished in June 1962 and the only service into Marylebone from Aylesbury was by DMU. Despite the ‘official end of steam down our line I can still remember a few occasions after steam services had officially there being a large steam engine to bring us home. I clearly recall one night, probably late 1966 or 1967, when me and my mate Anthony Silman went up to the Science Museum and we caught a steam hauled train back home. I think it was a Black Five but can’t be sure. 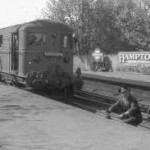 The early DMUs weren’t that reliable, the engine fell out of one at Rickmansworth once, so maybe when they ran short of rolling stock they dug an old steamer out and ran it for a while.. no idea, but we’d be in raptures. Sad gits. No one ever believed us but I’m sure it was true. 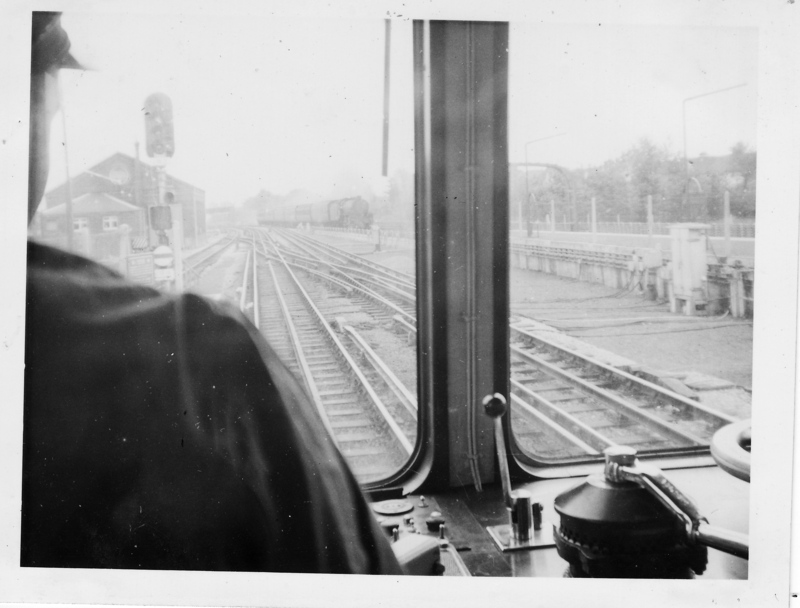 We may well therefore have been on the very last steam hauled train to stop at Wendover apart from the occasional London Transport Pannier tank pulling a works train that sometimes wandered down as far as Stoke Mandeville the last one, hauled by L94, ran down on 6th June 1971. It now lives at Birmingham’s Tyseley Museum. The last trace of scheduled steam at Marylebone actually went in 2002 with the removal of the still working turntable which was used to turn the engines on the odd ‘Special’. 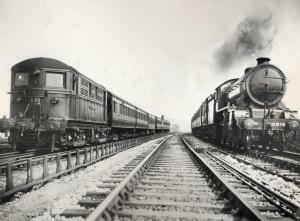 With the passing of steam our interest in trains gradually fizzled out. 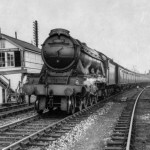 No more did we sit up on the Tractor Bridge or watch from the Puffing Billy line to RAF Halton, lifted in 1963, where it curved out of the goods yard, the expresses as they thundered through hauled by a Black Five, Standard 5 or B1 or occasionally a Britannia, Royal Scot or A3. Couple of engines that stick in the mind that thundered under the Tractor Bridge whistling as we waved was Flying Scotsman and Britannia herself heading up The South Yorkshireman. 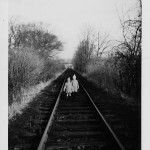 The picture is me and me brother walking towards Wendover sidings up the Halton Branch Line to see a Black Five that had failed one winter. 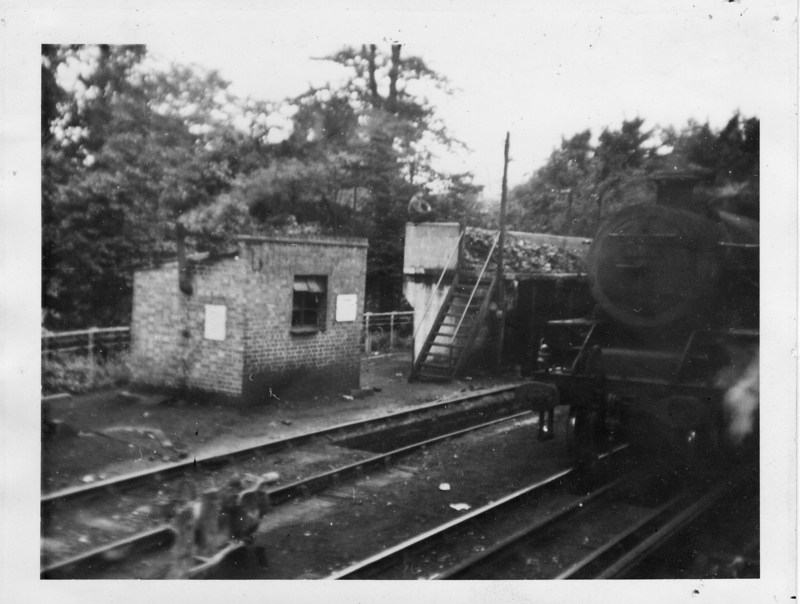 I recall the old chaps that worked the Halton Branch always seemed to know what engine would be on the front of which train and if you wandered across the field the signalman usually had the drop if anything special like a 9F or named engine was coming through. Mind you when we had kids we’d often walk up to the Tractor Bridge crossing the Halton railway on a summer’s evening and wave to the trains, something our grandchildren still do and if you fly low over a passing Chiltern Lines train the driver’ll wave and give you a good old ‘Doo Dah’. Fair enough we no longer jostled on the platform trying to be the first to spot the smoke from the approaching train but one thing that was brilliant about the very smart new Diesel Units we got, all green with a yellow chevron, was the drivers cab was separated by a window from the carriage so if you were lucky you could sit behind them and watch the road (yes its called the road) ahead. There were blinds that the driver could pull down at night but mostly they left them open. If a driver did shut the blind we used to get off at the first stop, bang on his cab door and politely ask if he’d raise it, which he often did. I remember once that the driver was having a bit of a test and the blinds were down. When we got on, plonked ourselves behind him and tapped the connecting door window. He opened it and told us very nicely to behave as the bloke with spagetti on his hat was very important and testing him but did pop the blinds up. When we got off at Marylebone he leant out the window and said thanks very much for being good and that he’d passed. My dad said we now had to salute which we did. 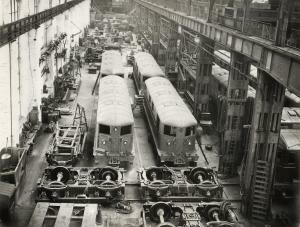 These first DMUs still carried goods and parcels, including the papers, in the large guards compartment, about a third of one of the power cars. 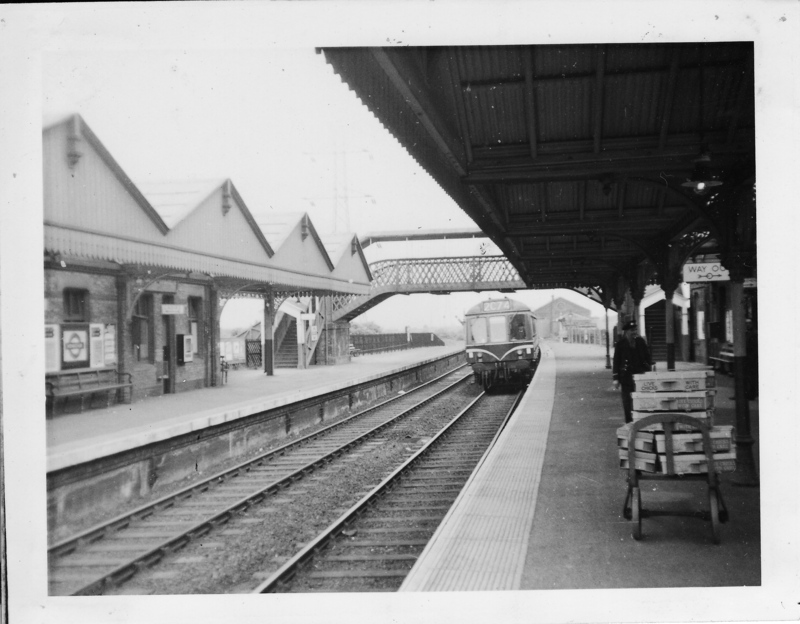 In the picture of the Marylebone train approaching Wendover station the boxes on the platform contain chicks from my god-parents chicken farm, The Orchards, now Haglis Drive. We were always told they were off on their holidays. Well all good things come to an end, usually. The lovely old Class 115 DMUs ran until the 1990s and the last A Stock Underground Train ran over Met Lines on Wednesday 26th September 2012 making them the longest serving stock on the Underground. Wendover is still open and is now served by Chiltern Rail trains that invariably run spot on time and you can now catch a Banjo Special, Aylesbury, first stop Stoke Mandeville, then Wendover, Great Missenden with the next stop Marylebone. The Great Central north of Aylesbury is slowly coming back to life with the recently opened Aylesbury Parkway on the Bicester Road with plans afoot to reopen the line to Milton Keynes. Although Marylebone has been extensively remodelled in recent years its hung onto its glass roofs and canopy, the Victoria and Albert pub within the station still serves beer and, just as they said when it opened in 1899, it is still the only London Terminus where you can smell flowers and hear birdsong. 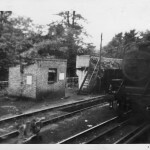 The Amersham sidings and engine shed have long gone, replaced by a car park, but at Rickmansworth, although the linesman’s hut is no more, just outside the station on the up side the old engine drivers cabin is still there just beyond the coaling stage behind the Fairburn that had pulled our train to Ricky taken as we pulled out behind John Hampton heading for Baker street all those years ago. http://www.rrhobby.ca/metvicbobo.htm Great little site all the names listed and plenty of further links. http://citytransport.info/Sarah-Siddons.htm Plenty more stuff on Sarah Siddons (the electric loco obviously! ).